Goa Management Association held its 43rd Annual General Meeting and Annual Day function 2018 on Friday, 28 September 2018 at the Grand Sala Conference Hall in Hotel Cidade de Goa. 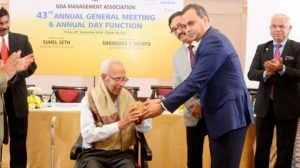 Mr. Shrinivas Dempo, Chairman, Dempo Group of Companies, Past President, GMA, and current AIMA National Council Member was the Guest of Honour. Mr. Suhel Seth, Managing Partner, Counselage India, noted author, advertisement professional, management consultant and well-known columnist gave the keynote address and spoke about the contemporary situation in the country, management challenges faced by professionals and industry and gave his opinion, punctuated with anecdotes about the desired approach to tackling contemporary challenges. GMA also distributed its Annual Business Awards 2018 at the Annual Day, felicitating the winners at the hands of the Chief Guest and prominent business leaders of Goa. The following awards were presented. GMA presented its first ever GMA Lifetime Achievement Award to Fr. Romuald D’Souza. Fr. Romuald D’Souza is often referred to, in jest, as the Founder of Founders. He needs no introduction to the field of management and the state of Goa. Goa Management Association was honoured to present Fr. Romuald D’Souza, with the first GMA Lifetime Achievement Award. Earlier in the day, the 43rd AGM was presided over by the President, Mr. Nitin Kunkolienkar, who welcomed the members and invited the Chairman to conduct the proceedings of the meeting. Mr. Rajiv Narvekar, Hon. Secretary of the Executive Committee, presented the annual report and highlighted the different events and programmes conducted by GMA during the year. Mr. Amin Ladak, Hon. Treasurer, presented the accounts for the year 2017-18. He informed the members that GMA had ended the financial year with a surplus. Members adopted the annual accounts for 2017-18 and approved the resolution to appoint auditors for the term 2016-17, among other business conducted.